The top consists of a finely figured mahogany top with fine, faded patina with a moulded edge. 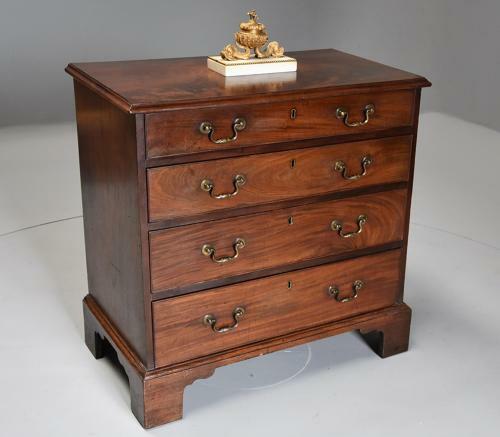 This leads down to four graduating cockbeaded drawers veneered with fine quality mahogany with oak drawer linings, each drawer retaining the original brass handles and escutcheon plates. Each of the ends of solid mahogany supported by a moulded edge, the chest supported by bracket feet both to front and back. This chest of drawers is in excellent condition for age (with some old repairs), is of stable construction and can go straight into a home.